» I paid but i am not able to view papers ? This might happen sometimes due to system errors. In such a case drop a mail to caseforest@gmail.com with your subscription number (can be found in the email from paypal after payment) and username for the caseforest.com. It can take about 24 hours to resolve the issue but 90% of times the issue is resolved within 6 hours after we receive an email from your side. » I am not able to find the solution to the case study that I have, what to do? If a solution is not available on caseforest.com, then probably that solution is not available anywhere on the internet as we are the biggest player in the case study industry. But the good news is that we are equipped with all the arsenal to provide you with a brand new, non-plagiarized and time-bound solution to any case study that you may want to. For further details please click on the "Order New Solution" tab at the top of the page. » How much does a subscription cost? Please visit the "Join Now" page to see our membership plans. Our rates are different for different countries. » When is my next billing? Your next billing is after the expiry of the duration that you have registered for. » Can I have a refund? Since we allow users to read summaries of articles before they join, we do not offer refunds. » What's in for a free member? At any moment 35% of papers available on Caseforest.com are absolutely FREE!!. Every week we shuffle and make another batch of 35% papers FREE. So, if a paper is presently a premium paper, it may become a FREE paper next week. Keep visiting this website or our Facebook page to keep yourself updated regarding the date and time of next shuffle. » How do I submit my own article? You can submit an article when you create your account (either free account or premium account) or if you are already a member, you can visit our article submission page. » Are the articles strictly categorised? No, because there are some articles which can be placed in more than one categories. 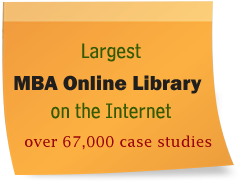 » Can I post free request for Case Study Analysis, MBA Term papers & Research Papers? Yes, if you are looking for some MBA related article and is not present on the website, you can post your request for free and you will be notified by email whenever an article is available for the requested topic(s). » How do you determine the number of pages in a paper? The page count is based on an estimate of 250 words per page. » Do you have bibliographies? Although most of our articles contain bibliographies, there may be others with none. » I thought this site was free, why is it asking me to pay? We have about 6,000 free articles on this site. You can, however, become a premium member and get access to 60,000 premium articles as well. Also, every month we send hundreds of Premium Account invitations to our free members on a random basis. » How can i cancel my subscription. You need to contact us atleast 7 days before your next billing date by using contact us form or sending email to caseforest.com@gmail.com. You will receive a confirmation from our side after it is done. Presently, this combo pack is inactive and will be back soon. When it is active the following will be its features: (1) Customized Case Study solution / analysis will be delivered in 7 days. (2) You can order 2 case study solutions free of cost till 6 months from date of joining combo plan. (3) Your case study should contain maximum 15 pages and our solution / analysis will be of 3 pages. » I have submitted papers but the status shows "rejected"? Your uploaded papers will get rejected due to one or more of the following reasons: 1. Your uploaded papers contain less than 1000 words. 2. The uploaded paper is NOT in .docx or .doc format. 3. Your uploaded paper is NOT a solution to a case study or any business related problem.